We are an eminent names of the industry engaged in offering high quality Metal Slitting Saws to the esteemed customers. The entire range is designed and manufactured by our team of highly experienced professionals. 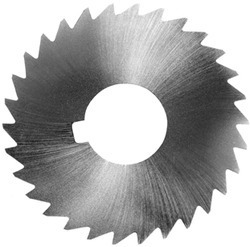 Our company is counted among the leading manufacturers, suppliers and exporters of premium quality Slitting Saw. Manufactured in accordance with the international parameters, these products are highly demanded around the globe. Offered products are tested on various parameters by the quality controllers before their final dispatch. We are engaged in the supplying of a diverse gamut of Metal Slitting Saws that is available in both coarse and fine pitch. The sides of the Metal Slitting Saws are ground with a slight concavity to avoid dragging into cut. We have unfurled our wings internationally in the supply of Metal Slitting Saws that are industry’s benchmark for innovation and quality. We strive for dominance and that we have successfully achieved by becoming one of the authentic fine pitch Metal Slitting Saws Manufacturers and Exporters in India. Coarse Pitch and Fine Pitch Metal Slitting Saws are supplied in plain tooth and staggered tooth form to give chip clearance. Looking for Metal Slitting Saws ?